Before you enter your home or your building after having flood damage in the Las Vegas area, make sure everything is safe. Be sure to check for damage to either the electrical or the structure of your home. Once your home is then safe to enter, you may then start the clean up process. The longer you let the water sit in your home or building, the more damage can be done. The most common damage done is mold damage. Mold can begin to grow in as little as 48 hours after having water damage. Be sure to start removing water and drying the area within at least 48 hours. A great way to slow down mold growth is to open windows if you can. This can help circulate air around to help speed up the drying process. Not only can you just open your windows, you can also use fans in your home as well. When it comes to saving items in your home, you need to decide what items could be trashed and what items have value to you. Items such as drywall, carpets, pillows, and mattresses are items that you should just trash rather than trying to save them. More valuable items like leather or antiques may be well worth trying to save. Depending on what type of water has penetrated your clothing will determine if you are able to save your clothes. Fabrics and clothing may be salvaged by using a washing machine to help remove the contaminates in the fabrics. If the water damage is not too extensive on your carpet, most times professionals can salvage them. However, the padding that is under the carpet acts like a sponge and will absorb most of the water. Thus meaning you should just throw the padding away. Professionals have the right tools and equipment to get the carpet dried the right way and restored back to the way it was before the flood. Not only can you save just the carpet, you can also save some of your wood floors as long as you are able to dry both sides of the wood. Wood is great at holding moisture and if you can not access both sides of the wood, then the floor will slowly rot away because of the water. When you are inspecting your walls with damage, be sure to look past at least a foot past where the water line stops on the wall. This will help ensure that there is no other water still left in you home to cause structural damage to your Las Vegas home. 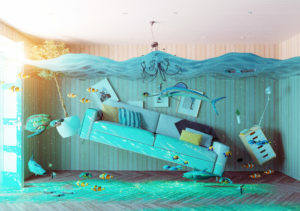 When you hire a professional to come look at the water damage in your home, they are able to decide what will be best for your situation. Each situation will need to be treated differently and the professionals at ERX in Las Vegas has the right knowledge and skills that are needed to help make sure your home is returned back to normal.